30 Travel Bucket List Destinations To Up Your Instagram Game! With social media applications playing a major part in our lives, Facebook, Instagram and Snapchat have become a medium to show your friends and followers what you've been up to. In today's day, who doesn't want to up their Instagram game by putting up pictures of hiking in the Himalayas or sipping on some cocktails by Thailand's exotic beaches? Who doesn't feel that tiny bit of happiness while your friends back home get jealous seeing you travel? It's undeniable that many places in the world are more expensive to travel to than others. But today, with the advent of hostels, frequent flyer miles, Airbnb's, street food and free walking tours, travelling can be as cheap as you like only if you plan smart. So now that money isn't a huge issue, what is stopping you from travelling and making your Instagram give major #WanderlustGoals to your friends? A Greek island located in the Aegean Sea, Santorini is popularly known for its black volcanic sandy beaches, food and wine. Whether you're looking for a romantic few days with your partner or in the mood for an all-girls trip, this tiny island town is the perfect place and definitely deserves to be on top of your travel bucket list. The beautiful white houses with blue domes against a sunset form a perfect backdrop for your pictures. What are you waiting for? Pack your bags! Even though it's one of the busiest districts in the world, New York city's Times Square will remain the ultimate photo booth. From bizarre to glamourous, this district has it all. Spend your day at Broadway, Empire State Building or the Museum of Modern Art, but ultimately, don't forget to add that perfect picture against the backdrop of the lit and colourful Times Square to your Instagram. World's largest amphitheatre, the Colosseum was built in 70-80 AD. Used widely for gladiatorial contests, mythological theatre performances and a general recreational and gathering place, the Colosseum today is one of the world's new seven wonders. Of course, you will be engulfed by tourists all around, but that won't stop you to take that gorgeous selfie. Isn't it a well deserved destination to be on your travel bucket list? In this country full of natural wonders, every corner is an instagrammable spot. However, nothing can do justice over the breathtaking beauty of the bamboo groves of Arashiyama. A stroll or bicycle ride through this forest will give you all the serenity you need after those busy shopping days in Tokyo city. With a history dating back to 500 years, Havana is one of the most cultural cities in the world. Monuments, art galleries, narrow streets with colourful classic Chevys zooming past you, typical Cuban restaurants, bars and nightclubs, this city will take you back in time. Get your tickets while it's still not as eaten up by tourists like many other places in the world. With a diameter twice as long as the planet of Pluto, how can this wonder of the world not be on someone's travel bucket list? The Great Wall of China, an architectural marvel is has a rich and significant history. One picture of you strolling, hiking or camping on one of the sections of this wall on your Instagram, and watch your friends drool. Now, this is surely a travel bucket list destination for people around the globe. In the grandest possible way to show love, Shah Jahan built a mausoleum for his beloved wife Mumtaz which we today call the Taj Mahal. An architectural wonder of the world, this monument is made of pure white marble and took 22 years to complete. Visit during sunrise or sunset to get a mesmerising photo, or if you miss it, take a boat ride on the Yamuna and capture the Taj in all its grandeur. Literally dividing the world into 'East' and 'West' after World War II, the Berlin Wall finally crumbled in 1989. Since the reunification, this wall is symbolic in nature with over a hundred murals painted by artists from all over the world. Depicting culture, cartoons, political references and many other bizarre paintings can be found along this stretch. Get your Instagram shot posing in front of one of these colourful pieces of art. Mother nature's gift to the USA, the Wave in Arizona is a stunning colourful sandstone formation in the form of rolling waves. Particularly popular among hikers and photographers, this trippy phenomenon will give your Instagram feed a whole new boost and major goals for your travel bucket list. The most visited tourist attraction in Vietnam, Halong Bay is a vast coastline with thousands of limestone structures protruding out of the water. This UNESCO world heritage site has many tiny islands and floating fishing villages to explore. But to catch that iconic photo of you against the entire bay, trek to one of the hills in the Halong city and get your cameras out. A real life fairytale destination, Sintra is a small UNESCO world heritage town, perfect for a weekend getaway from Lisbon. Full of castles and palaces with charming medieval architecture, an Instagram post on your trip to Sintra is sure to make your friends go 'Wooooah!'. With the breathtaking Pacific Ocean as your backdrop, who wouldn't like a trip to one of USA's most gorgeous coasts and show it off to the world? Whether you want just to sunbathe and relax on the beach or pick a hiking trail, the Oregon coast offers it all. Make your way into the Uluru-Kata Tjuta National Park to witness Australia's most incredible landscape. The Uluru Rock is an indigenous sacred natural site made of sandstone. Located in the heart of the continent, catching a sunset here and uploading it would make your followers super envious. Perfect for the romantics, the Eiffel Tower of Paris is one of the most sought after tourist destination in the world. Climb up or gaze at the beauty from the bottom, but don't forget to get that classy "I travelled to Paris" picture! Also, if someone reading this is planning a proposal, this is the place to be! The vast, blindingly white, expanse of this Bolivian salt flats is one of the most surreal natural wonders of the world. A photographer's paradise, visit here while it's still untouched and raw. And, don't miss on befriending some pink flamingos. Situated in the Banff National Park, Moraine Lake is a picturesque blue-green lake, perfect for some nature rejuvenation. In summer, you can kayak on the lake and take surreal memories back home. A prehistoric monument of Wiltshire, England, Stonehenge is a grand stone circle situated in the middle of the vast and gorgeous countryside. Some myths seem to be surrounding these stones; however, you first got to worry about that beautiful Instagram post you're putting up, right? 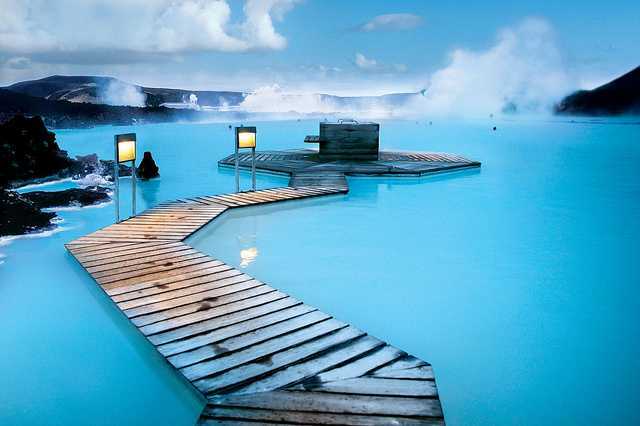 Although Iceland may seem extremely expensive for some, the milky blue waters of the blue lagoon are going to be all worth it. Trust me. A tranquil beauty along with healthy qualities like the presence of mineral salts, silica mud and algae proven by dermatologists, this peninsula is like an other worldly place. The tourism has considerably risen, but you can find your small secluded spot and still get a perfect picture. One of the worlds biggest and most ancient covered markets, Istanbul's Grand Bazaar is a dreamland for shopaholics. Colourful antiques, carpets, traditional Turkish textiles and many food stalls selling Kebabs other middle-eastern delicacies, all of this makes for a wonderful backdrop, right? Get your haggling caps on! One of the new seven wonders of the world, Machu Picchu mountain in Cusco, Peru is a sacred religious site from the Inca times. With stunning Inca architecture and surrounded by majestic mountain peaks, these ruins provide a true understanding of the Peruvian culture. A particular favourite among hikers and photographers, a picture of you with a Llama is enough to blow everyone's minds. The oldest of the seven wonders of the ancient world, the great Pyramid of Giza is a massive tomb with chambers inside where deceased kings and queens were buried. The unique and magnificent design of this structure attracts tourists from all over the world who want to tick it off their bucket list. Nothing beats the cold air breezing past you while you soak in views of tea plantations, lush forests, gurgling waterfalls and tiny village communities on your train journey from Kandy to Ella in Sri Lanka. A window seat or standing by the door is the perfect way to experience this epic ride, and even get your Instagram comments flooded with some lovestrucks! Famously known as 'Stairway to Heaven', the Haiku stairs of Oahu, Hawaii is every hiker's dream. With around 4,000 steps, damaged in certain places, this climb is sure to give you all the adrenaline rush you were looking for. The spectacular view might just fill up your phone gallery, so beware! One of the most famous places in Africa and a UNESCO World Heritage site, the Serengeti National Park is a vast protected land of wildlife. A haven for wildlife photographers, the best time to visit this park would be during the great migration when six million wildebeests can be witnessed moving from one place to the other. One of the most picturesque architectural sites in the world, the Shah-i Zinda of Samarkand, Uzbekistan is a cultural necropolis. The intricate carving, rich tilework and craftsmanship make this avenue of mausoleums unique. Don't forget to wear a beautiful outfit for an unforgettable picture. Bali is full of rice paddies, but nothing compares to the inexplicably scenic Tegalalang rice terrace of Ubud. Best experienced and clicked during sunrise or sunset; you can chill at one of the restaurants overlooking the terrace, or even climb up and down the paddies yourself. The magnificent Nabataean architecture of this red city makes Petra one of the best archaeological marvels in the world. Middle East's treasure for travellers, keep your Instagram captions ready for this wonder that'll make you feel like a dwarf. The magical wonder of Aurora Borealis, or the Northern Lights, is a phenomenon of magnetic fields. An experience that is on every traveller's bucket list, Norway is one of the best countries to witness this. You need clear skies and pitch darkness to be able to capture it perfectly, and many stations in Norway offer this opportunity. Make sure you don't miss out mentioning this phenomenon while curating your travel bucket list. Millions of tulip bulbs planted in the garden grounds bloom during the Spring. Keukenhof garden in the Netherlands is a fairytale land which is just the place you need to make your dull Instagram feed colourful. Probably one of the most touristic experiences, but who doesn't want a picture from your charming gondola ride in Venice? Be ready to indulge in some Romeo-Juliet feels while you spend your time exploring the grand canal with your very own Italian gondolier. If a list of 30 Instagram-worthy destinations in the world doesn't make you open a new tab for booking flights, we don't know what will? It's never a bad thing to want to make your friends a little jealous of your travels. Go be a student of the global classroom and upload your experiences on your Insta!